I am taking a mini-break from poetry to write my monthly book review post. I am proud of myself for reading nearly 100 books so far this year. I’m reading David Leibovitz’s newest cookbook My Paris Kitchen and Susan Campbell Bartoletti’s Hitler Youth: Growing up in Hitler’s Shadow. I started listening to Robert M. Edsel’s Saving Italy: The Race to Rescue a Nation’s Treasure from the Nazis, which is quite good, but will have to put this book on hold while I listen to another book I’ve been waiting ages to read, Rainbow Rowell’s Eleanor & Park. I’ve not been reading too many award-winning books as I kind of got burned out on them, and am taking a bit of a break. I haven’t read many children’s books in the last month as before because I was reading for a Winter Reading Program last year with my son, hence many more books. As usual I rate books on a scale of 1 – 5 stars, with one being the lowest and five the highest. I am still trying to finish my Caldecott Challenge, and with all the winners and honors. I’m down to 18 books left to read. I’m also completing a Newbery Challenge, where I’m reading all the award winners and at least one honor book. Most of the reason this book is getting any stars at all is because I love Paul Schmid’s illustrations. The story, however, left a little to be desired. The concept was that Oliver is going to his first day of Kindergarten, but he is scared, so he picks up an alligator along the way to school. Anything that scares him, the alligator eats. This could’ve been a really cute book, but the alligator eating everything just made it creepy to me, and a little bit like “let’s all ignore our problems kiddies and they’ll just go away (or rather be eaten by an alligator)”. The alligator eats everything, including Oliver’s new teacher and all his classmates, but then Oliver realizes that he’s kinda bored. It sounds like of cool things happening inside the alligator so he goes inside too and then he starts having fun. Recommended for ages 4-7, 3 stars. Langstaff has once again created a delightful picture book with illustrator Feodor Rojankovsky. Their previous book Frog Went A-Courtin’ won the 1956 Caldecott Medal, and I loved the little detailed nature illustrations. It was based off a folk song and this book is based off a nursery rhyme counting song (the lyrics and music are in the back). 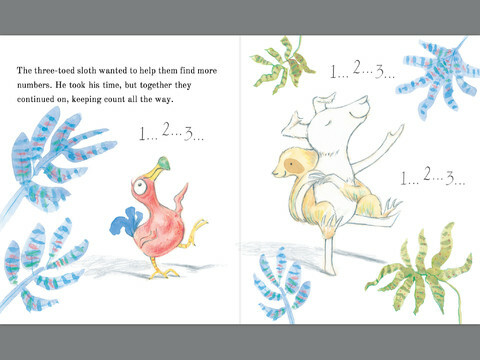 The story/song is rhyming and through each verse, the animal, number and activity change. For example, for the number 7, there are one mother frog and her seven pollywogs who hop in the bog. I really enjoyed this book, though I was a little sad that my son wasn’t as enthused as I was. Recommended for ages 4-6, 4 stars. I got this for my son as he likes Dr Seuss and I only had a copy of his books at home. This was not as good as I wanted it to be. 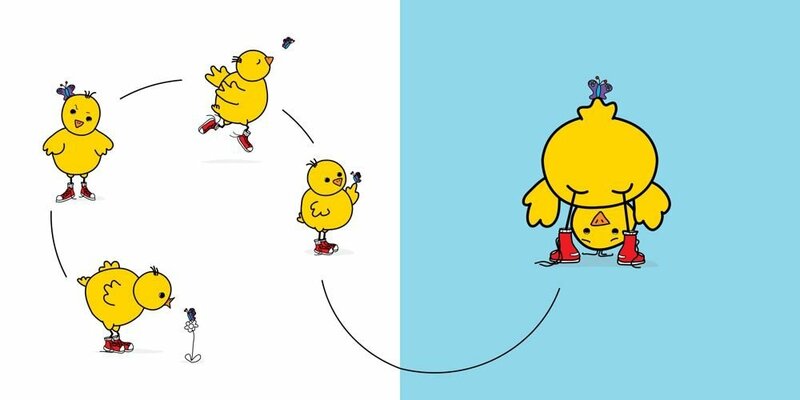 The boy uses his imagination to think about what his life would be like if he had things like duck feet, an elephant’s trunk and a whale spout, or even better all of them together. But then he realizes that he is better just being himself. Of course, it took him over 65 pages to realize this, and the story dragged on and on. My son got bored pretty quick, as did I. Recommended for ages 4-7, 2 stars. I knew there was a reason I never read this book. I’m not good at tongue twisters, and that is pretty much the entirety of the text. 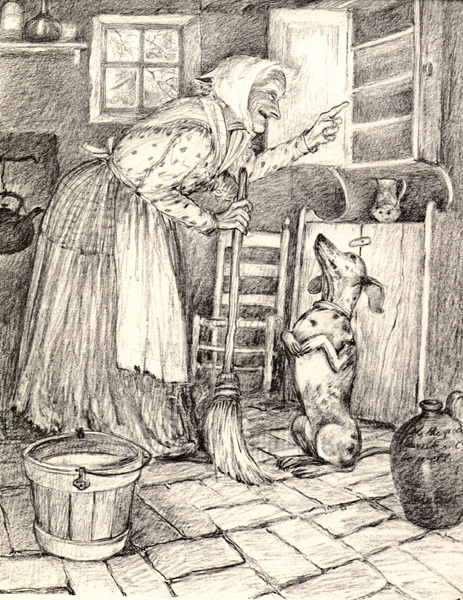 The story features a fox, in socks naturally, and a man named Mr. Knox. The fox loves to say tongue-twisting rhyming phrases, but Mr. Knox does not. However, eventually Mr. Knox gets so tired of the Fox that he out-rhymes him to end the game (which is my favorite part of the book, mostly because the fox is kind of annoying). In some ways, this book reminds me of the two characters that play off each other in Seuss’s “Green Eggs and Ham”. Recommended for ages 4-7, 2 stars. I remembered this book, while I was reading the title story to my son, as another one of the Dr. Seuss books I had as a child. The first story is about a boy who believes he can beat up thirty tigers, but the longer he is with them, the less he thinks he can beat. I liked the story although my son I don’t think understood most of the nuances of it. The second story is about the king of cats who didn’t like his tail to drag on the ground, so he hired someone to carry it. And then they felt important and didn’t want theirs to drag either, and so they hired someone and on down the line until the smallest cat decides he’s had enough of carrying other people’s tails. He quits quite loudly and the rest follow suit, and that’s why cat’s carry their own tails now. The third story was hard to explain to my son, but I rather enjoyed doing the voices for it. A young girl usually imagines pretty fluffy things, and then uses her Un-Thunker to make them go away. One day, she decides that she wants something more substantial, and so thinks really really hard and comes up with the Glunk. He is a large green monster who immediately starts using the girl’s phone to call his mother long distance, even though it is dreadfully expensive and will make her father go broke. He ignores her and keeps talking until, with the help of her brother, they Un-Thunk the Glunk together. From then on, she is back to pretty fluffy happy things. In a way, that story is rather sexist. Specifically because the girl only has fluffy thoughts and the one time she tries to really concentrate, she creates a monster, that she can only get rid of with a boy’s help because she is too weak. Aside from that, overall the stories were ones that me and my son enjoyed. Recommended for ages 4-7, 3 stars. 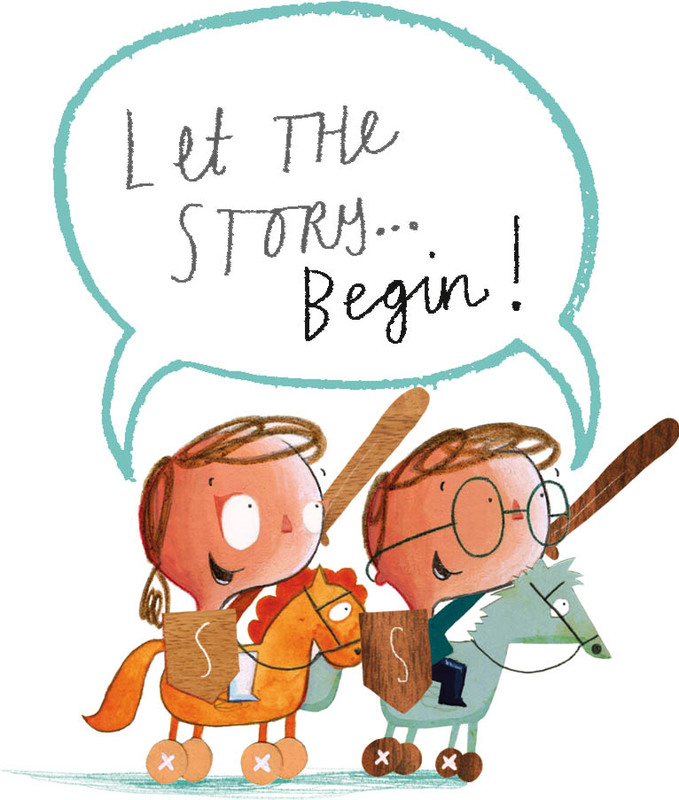 I’m glad I’m doing the Caldecott Challenge, even though it’s taking me forever to finish, as I get to discover so many awesome authors and illustrators. Newberry is just so good at illustrating cats, and T-Bone is the biggest fluffiest cat I’ve ever seen. This book won a 1951 Caldecott Honor, and it is a nice quick read. T-Bone is a great babysitter for Mrs. P’s baby girl. She’ll sit in the basket with her, sit on the dresser and purr during naptime and allows Mrs. P to get all her housework done. One day, T-Bone wakes up and decides she is tired of being a good kitty and decides to cause a little chaos. Her actions drive her owner to distraction, and she sends the cat away to the farm. T-Bone doesn’t like the farm as he isn’t given any special treatment. The baby does not like that T-Bone has left and won’t stop crying for days. So Mrs. P sends her husband to get the cat back. Everyone is happy. 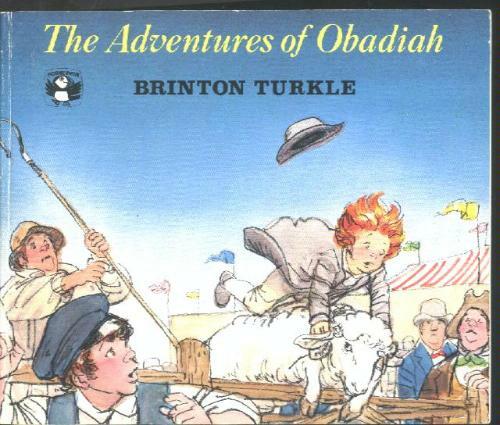 Recommended for ages 3-6, 3 ½ stars. I will admit, that I was a little hesitant to read this as the last book illustrated by Lynd Ward (The Biggest Bear, which won the 1953 Caldecott Award), I was really not a fan of as it involved bear-killing for sport. This book won a 1950 Caldecott Honor. My biggest complaint about this book is the length. It’s about 96 pages, granted that’s with illustrations, but still, that’s a really long book for a child. This is especially true because the subject matter sounds like it was taken almost directly from a history textbook, with a bit of a dramatic flair added. I’ll be honest though, I didn’t know much of anything about how New Hampshire and Vermont were created, so that part was interesting. Despite the length, I found it to be an interesting read. Ethan Allen, who I associate with furniture (although I don’t think there is actually a link), was in reality a man born in the early days of the American Colony. He had a great capacity for learning and business and succeeded in both. He eventually bought land through the New Hampshire Grants, and settled his family there. The only problem was that while they were selling it to settlers in Connecticut, they were also selling the land to New Yorkers. The Connecticut folks were settling there, while the New Yorkers were just using it to sell on to others and had no intention of actually living there. Ethan Allen became the head of the “Green Mountain Boys” an untrained militia that protected the New Hampshire settlers from the Yorkers. The year 1775 rolled around and Ethan Allen thought it would be a great idea to take Fort Ticonderoga, occupied by British troops. So he gathered a small army and set out for the fort, where they were met by an actual Colonial officer Benedict Arnold, who had been sent to lead the army. This didn’t sit well with the Green Mountain Boys and Ethan Allen, who allow him to be at the head with Allen but not lead. The patriots easily take the vulnerable Fort Ticonderoga and a smaller second fort. Allen tried helping the Continental Army take Montreal, but they failed and he was captured, along with about thirty of his men, and sent back to London for execution. But the English did not kill them, and instead sent them on a boat back to the Colonies. The British tried to offer Ethan a commission in the British army, but he turned them down, as he was a fierce patriot. He spent three years in a Colonial prison managed by the British until he was finally released back to the New Hampshire Grants, though Ethan’s home was now called Vermont. He died in 1789. Vermont became a state and part of the new United States in 1791. Recommended for ages 7-10 years old, 3 stars. This was another fascinating book by Leodhas, which was almost completely ruined by Evaline Ness’s horrible illustrations. This 1964 Caldecott Honor book is based off a counting Scottish folk song that the author grew up with. A boy is going to the mill to grind some corn into flour, and along the way he meets sheep, gypsies, farmers, geese, and all sorts of other things which join him on the way to the mill. I am very interested in reading more by the author. Recommended for ages 4-7, 3 stars. This was a very unexpected book for me. I knew nothing about it, other than it was written by Margaret Wise Brown, whose work I’ve come to admire through the Caldecott Challenge. It won a 1955 Caldecott Honor and rightly so. I was pleasantly surprised with not only the story but also the illustrations. 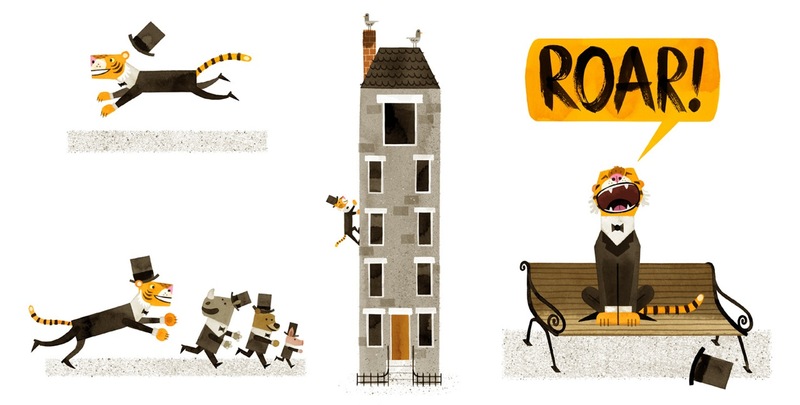 The book is a story about storks, who like to nest on the unused chimneys of houses in Eastern Europe in the spring. The locals believe it is good luck for them to nest on their house and so they will tie wagon wheels to their chimneys to act as a base for the stork’s nests. 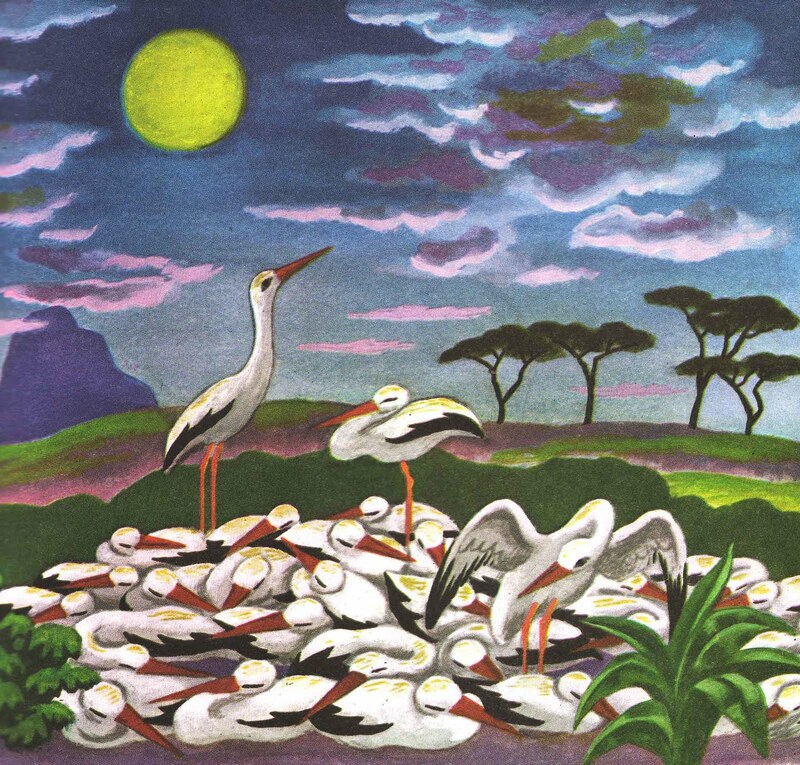 The stork families built their nests, have babies and then in the winter, they all fly down to Southern Africa. The book also told the story of one stork that got lost and ended up staying on a boat heading for Egypt for a bit, then rejoining his stork brethren later on. I loved the happy detailed illustrations from Tibor Gergely, of the storks and the environments that they inhabit through the different seasons, which makes me want to check out more work of his. I absolutely love this book. I have no idea where the author came up with the idea for this book, but she is a genius. I enjoyed her other books, The Miraculous Journey of Edward Tulane, Because of Winn-Dixie, and The Tale of Desperaux. However, this book won the 2014 Newbery Award, so I had to check it out. The chapters are short, only 1-4 pages. The book is hilarious, but the illustrations make the book even funnier. I think my favorite scene in the book is where Flora and her father are in the Giant Do-nut. I loved the epilogue! Flora Belle Buckman is a nearly-eleven year old girl whose parents have been recently divorced. She lives with her mother, who writes romance novels on a typewriter. Flora loves reading comics, especially reading about Incandesto, her favorite superhero. 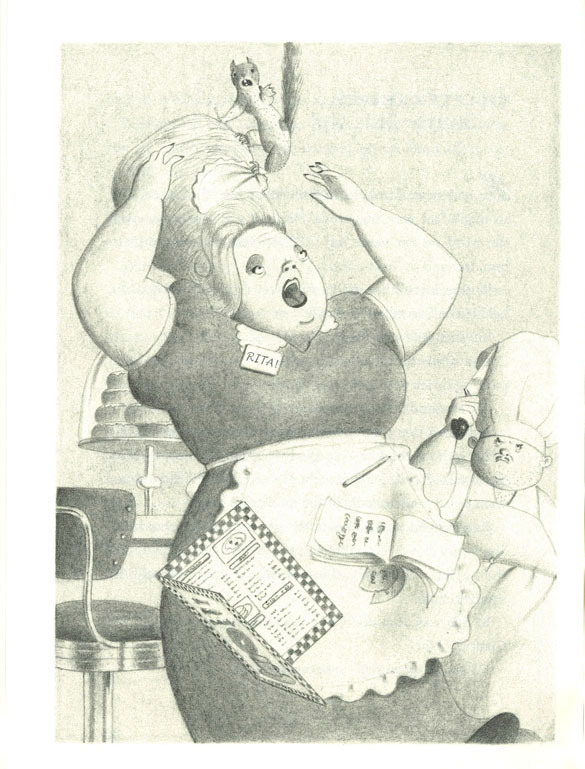 One day, her neighbor Mrs. Tickham (aka Tootie) gets an incredibly powerful vacuum, which escapes the house, goes outside, and swallows a squirrel. The whole surreal scene is seen by Flora who rescues the squirrel, which miraculously survived, and names him Ulysses. She believes he is a superhero, as he can do some pretty amazing things, like picking up the vacuum by himself, typing and flying. Tootie has her great-nephew William Spiver, who has gone temporarily blind due to trauma, and Flora can’t decide if she likes him or not. The only person that really doesn’t like Ulysses is Flora’s mother, who demands Flora’s father gets rid of the squirrel, which he doesn’t. Flora’s father then tells her mother that the squirrel will be living with them, but after she comes upon the squirrel typing late one night, she cracks. What will be the fate of the furry defender of Flora? To find out, read this fantastic story. Recommended for ages 7-12, 5 stars. I would probably have not picked this book up on my own, mostly because I hadn’t heard of it, but the book had won the 2005 Newbery Award so I decided to give it a try. The book is interesting becauseit is told after the events of the book by the main character, looking back on her childhood and life with her sister. The narrator was really good at switching between her normal accent, a Japanese accent, and one from the Deep South. Katie is a five year old Japanese-American girl in the mid-1950s who lives with her older sister Lynn and her parents in Iowa. They run a Japanese market in the town, but it closed down, and her parents decide to move to Southern Georgia. Her uncle lives there with his family and works in a chicken hatchery separating the males from the egg-producing females. This is where Katie’s father will work too. Her mother will work in a chicken processing plant. Lynn and Katie grow up in Georgia, are very close to each other. Her mother later has a son named Sammy, who completes their family. The whole family has to deal with racism while living in Southern Georgia, as they are subtly ignored by the white population there. When Lynn is sixteen years old, she starts to get ill and has to go to the hospital a lot. Lynn later dies and Katie, now eleven years old and her family must come to grips with Lynn’s death. The title comes from the Japanese and it means sparkling or glittering. I think it refers to Lynn and how she was viewed by her family and in turn, how they looked at the world, especially Katie. Recommended for ages 9-13, 3 stars. I’ve known about this book for awhile, but never got around to reading it. It won the 2010 Newbery Award. Frankly I was confused for most of the book trying to figure out who exactly was sending Miranda the mysterious notes, and even when they did reveal it, I was still a little confused. It definitely kept me on my toes though, which was nice. This book tells about a twelve year old girl named Miranda living in New York City whose mother wins a spot on the gameshow, The $20,000 Pyramid in 1978. Miranda spends most of the time helping her mother drill for the show which is about a month away, with the help of Richard, her mother’s boyfriend. Miranda is dealing with problems of her own. Her best friend Sal is randomly punched by Marcus, another kid at their school, and they start drifting apart. She starts hanging out with Annemarie and they ending working for lunch at the sandwich shop, known as Jimmy’s, down from the school. Someone starts leaving notes for Miranda and she can’t figure out who they are from. She is freaked out by the entire situation, as the person knows things they shouldn’t. Will she ever find out who is sending the messages? Will her and Sal ever talk to each other again? Who is Marcus and what is his deal? To find out read this fascinating book. Recommended for ages 9-13, 3 stars. I had heard of Marian Anderson before, but never had the opportunity to read a biography of the singer. I had also heard that Russell Freedman books were quite good, not only because he had won so many awards but because his books are well-researched and on interesting topics, so I was excited that he had written this book. 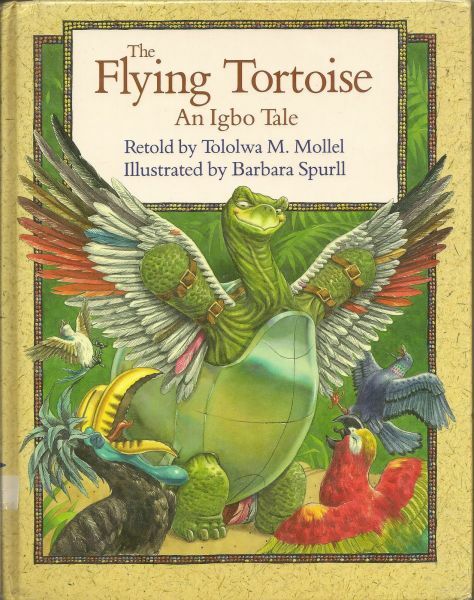 It had won a 2005 Newbery Honor award, as well as the Sibert Medal for that year (which honors great nonfiction books for children). It was a very personal biography of a fascinating woman with great determination and perseverance, who opened the doors for future generations to experience new realms of possibility. Marian Anderson grew up in Philadelphia at the turn of the 20th century. Her African-American family was poor, but she was a very talented singer from an early age and helped out her family financially throughout her life. It was hard for African-Americans to get recognition of any kind, and it was even harder in music performance. She had to suffer through many hardships related to Jim Crow Laws and segregation in America. She was a huge hit in Europe in the 1930s and came back to the US to conquer her native country as well. She set about doing just that until 1936, after performing for President Franklin D. Roosevelt and his wife Eleanor at the White House (who thought she was amazing), when Howard University tried to get a booking for Constitution Hall on her behalf. It was the biggest auditorium in Washington DC and the home of the Washington Opera and the National Symphony. The Hall, which was owned by the Daughters of the American Revolution (DAR), allowed only whites to perform there. Eventually it was decided that Marian would have her concert no matter what, and so a free un-segregated concert was held outside in front of the Lincoln Memorial on Easter Sunday 1939. It was attended by 75,000 people. After this event, Marian became more involved with the NAACP (National Association for the Advancement of Colored People) and the fight for civil rights for African-Americans. The setting of the Lincoln Memorial was used again in August 1963 when Dr. Martin Luther King Jr. gave his I Have a Dream speech at an event that was also attended by Marian. She broke the color barrier in the operatic world in January 1955 when she appeared with the Metropolitan Opera in New York City. She eventually married Orpheus Fisher, who she had known since high school, in her 40s and they lived together on a farm in the Connecticut countryside until his death. Highly recommended for ages 7-12, 5 stars. I loved Mori’s manga series Emma, so I decided to give this one a try as I am on a bit of a book lull at the moment. This was a nice quick read, as most of the illustrations had very little words. It tells the story of a family in Turkmenistan in Central Asia, whose youngest son Karluk at age twelve marries a girl of twenty named Amir from a neighboring village. The girl is quite different from the boy who is shy and keeps to himself and his family, while Amir is outgoing, vivacious and a great bow-hunter. They are slowly getting to know each other, and you can tell they care about each others with the little gestures that they do. For example, she kills some rabbits for them to eat and then uses the fabric given to her by her in-laws to make him a rabbit fur-lined tunic, and he goes to search for her after he learns there may be wolves where she’s decided to hunt. His family is just starting to like her when her eldest brother stops by with some cousins and demands that her in-laws return Amir to them. They refuse and the grandmother, who originally came from their family, stops Amir’s family with an arrow. My favorite scene in the book was when they were on their way to Karluk’s uncles’s family, and they found pomegranates along the way and she was so excited. And the whole scene where they were going to sleep in the yurt (a movable house tent) was priceless. I can’t wait to read the rest of the series! Recommended for ages 14+, 4 stars. Another well-researched and fascinating glimpse into the lives of young brides in Turkmenistan. 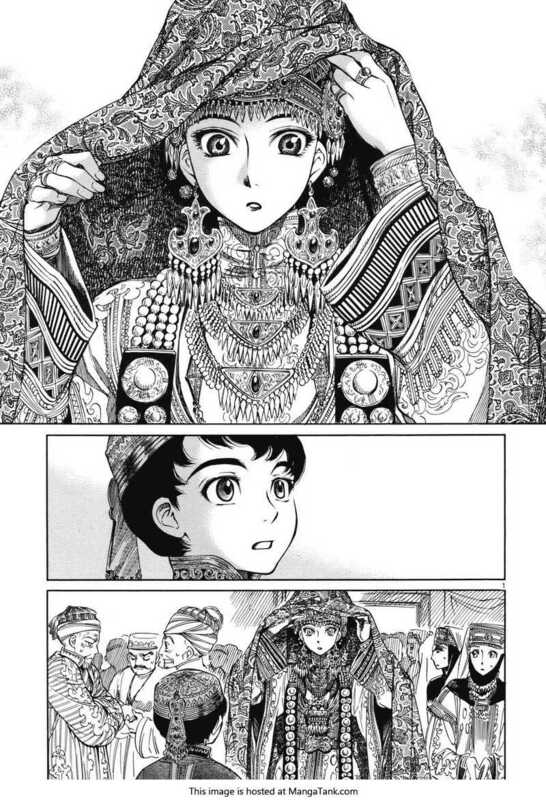 This volume is a continuation of the story from the first volume, featuring the same bride, Amir. She meets a new friend Pariya, a younger girl whose parents are having trouble marrying her off because she is very vocal about who she is and what she wants, at the communal ovens. She can’t embroider, but makes amazingly detailed breads. Amir takes her under her wing and tries to teach her how to use the bow and arrow. On one of their outings with Amir’s husband Karluk and the English observer, Mr. Smith, they come across a sort-of shrine thought to bless women who want to have children. On the way out, they run into a riding party made up of Amir’s family, who have decided to come en masse and force her to marry a wealthier man. Mr. Smith comes up with an ingenious way to separate Amir and Karluk from Amir’s family, and temporarily saves them. They rush back to the village, and tell Amir’s father and grandfather the news. All of the villagers decide to take arms against the intruders. Even young Karluk helps to defend his wife. They are successful and the family is driven off again. Mr. Smith asks about the cloth preparation, a term used by Amir’s family. It means that girls at a young age gather cloth, needles and thread to start creating the sheets, clothes and other embroidered material that will become part of their dowry when they marry. Karluk’s niece is of age to start this, so her parents start gathering the material. He follows the women in the family as they go to their storeroom to show the girl the patterns used by the family, and she finally finds one she likes. Letters from back home and a messenger soon arrive for Mr. Smith, who reluctantly leaves to go to his original intended destination. Recommended for ages 14+, 4 stars. I was a little sad to say goodbye to Amir in the last volume, as I really enjoyed getting to know her character, but thankfully she made an appearance in this one as well. Mr. Smith, who has taken a very backseat role in the first two volumes, is front and center for the next few books. I’m hoping they’ll give more back story on him to fill in a lot of the gaps. As in the other books, the artwork is stunning even in black and white, and full of so much detail. At the end of the last volume, Mr. Smith had left Karluk’s family and was headed to a nearby city to meet up with his guide. When he gets there, he and a young woman both get their horses stolen. They are returned by the local magistrate and the woman named Tala invites Mr. Smith back to her and her mother-in-law’s yurt as a guest. The young woman has had a very unfortunate history, which her mother-in-law (who she simply calls mother) relates to him. The mother had five sons and Tala was married to her oldest son. He died of an illness after a year, and they had no children, so she married the next oldest. In time, all five of them had died and the mother’s husband was so heart-broken, he died soon afterwards. This left Tala and her mother-in-law to take care of their sheep and themselves. While Mr. Smith is there, he gets to know Tala and enjoys her company. One day, an uncle of the young woman comes in demanding her hand for as his son’s second wife. The mother refuses because she knows the girl will basically be a slave in the household and have no rights, and tells the uncle that Mr. Smith has asked for Tala’s hand in marriage. Of course, then Mr. Smith walks in and is rather surprised by it all. He decides that the best thing to do would be to leave. So he goes back to the city and immediately gets arrested after the uncle, unhappy with the answer from the mother, got Mr. Smith put in jail on trumped-up charges (they think he is a Russian spy). 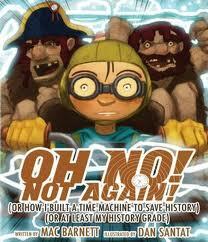 After spending a period of time in jail, his guide, Karluk and Amir finally come to the rescue. Tala follows shortly afterwards. They try to make Mr. Smith look less foreign, so he won’t get into trouble in the future. Tala finds him again, worried after she learned that he had spent the time apart from her in jail. Mr. Smith has developed feelings for her during his long time to think in prison and ends up promising to come back and find her, leaving her with his gold pocket watch. As he escorts Tala back to her yurt, they find out that her mother has married the uncle to appease him and he is now considered the young woman’s father. He obviously dislikes Mr. Smith and refuses to let them see each other, and her mother-in-law tells him to forget Tala. He is heartbroken but leaves with the guide, and Amir and Karluk go back to their home after eating an enormous meal together. It turns out Mr. Smith was originally destined to go to India, where he has a small house, but got sidetracked in Turkmenistan. He heads there now with his guide Ali, though it will be a very long trip. Recommended for ages 14+, 4 stars. After devouring the first three volumes in the series, I was anxious to get my hands on the fourth volume. This story was a little bit different from the rest, mostly because there wasn’t as many things going on. It starts out with Mr. Smith heading with Ali to Ankara (sp?) but they get sidetracked after he falls off his camel into the Aral Sea and is rescued by twins Laila and Leily. When they realize he is a doctor, they immediately take him to their grandfather, who has a dislocated shoulder. He quickly fixes that problem and soon everyone in the village is waiting for him to help them. Laila and Leily are trying to catch rich handsome husbands, but not having much luck in their small fishing village. Eventually, their father and his friend decide that they will be just fine for their father’s friends’ sons, Sarm and Sami. They’ve all grown up together but never really thought much of each other until they are forced into the situation. The twins decide that these boys aren’t so bad after all, and pick which one best suits them. They are preparing for the wedding at the end of the book. My favorite part has to be a tie between the twins’ grandmother hoodwinking them into working hard, pretending she is giving them a “charm” for future suitors, and when their mother gives them a crash course in being wives. These girls look so young to me, way too young to get married or even thinking about it (though I know the average age was probably 12-14 years old). Recommended for ages 14+, 3 stars. I got this book as a freebie from the Tucson Book Festival. It had been on my to-read list for awhile, so I jumped at the chance of getting a free copy. The author did a good job of keeping me in suspense, as I spent most of the trying to figure out what exactly was going on. She didn’t reveal the whole plot until the very end and then it was a total surprise. I’m so excited that there are more books in the series and more story about Lane, as I found him one of the most interesting characters. Katherine Tulman lives with her widowed Aunt Alice and her fat lazy cousin Robert. She is an orphan and must rely on their charity to survive. As her aunt’s bookkeeper, she has been taxed with going to see her Uncle Frederick Tulman and asserting that he has gone mad, so he can be put into an asylum. Robert would then inherit his money and Katherine believes she would have some measure of freedom. But things are not as they seem at her uncle’s estate. Frederick, who goes by Uncle Tully, has an enormous estate that houses two villages that work at the gasworks on site and support the house. He is a little eccentric, but Katherine is still undecided whether he is insane until she has all the facts. She will take thirty days to collect evidence against her uncle, though she feels guilty since there are so many people depending on him for their livelihood. Will she rule in favor of Uncle Tully or her Aunt Alice? To find out, read this intriguing book. Recommended for ages 13+, 4 stars. I quickly devoured the first book The Dark Unwinding, so I was excited to learn that she came out with a second book for the series. I will admit that despite not finishing books I started earlier, I was totally engulfed in finishing this one instead. This one, like the other, is a little slow in the beginning, but suddenly all these mysteries are revealed and it really keeps you riveted. This one had even more surprises than last time, and I hope that the author decides to continue the series as I know I would love another book. Katherine has now been at Strathwyne for two years now, after she miraculously received her inheritance from her father and grandmother. Things are just starting to return to some normalcy after the events of the previous book, when suddenly she is awakened in the middle of the night by masked men trying to break into her bedroom. The situation is quickly neutralized with her maid Mary’s help, but they’ve got bigger problems now. The government of Great Britain wants to take Katherine and her Uncle to London to help them build weapons against the French, but Katherine knows that is not possible, given her uncle’s unusual behavior and manners. So she plots with her solicitor Mr. Babcock to take Uncle Tully, Mary and herself to Paris, to her grandmother’s estate, away from the government’s control. She is also trying to find Lane, who disappeared over a year ago and whom the British government has reported as dead. The biggest problem she faces, aside from not speaking the language, is that her reputation has proceeded her. Her aunt has been spreading around gossip about her in London and it has made its way across the pond to Paris, where the upper classes escaping London have retreated. One of her aunt’s friends is living right next door to Katherine. Will her uncle be discovered? And if so, by the French or the English? Just what exactly happened to Lane? To find out this and more, check out this awesome second book to “The Dark Unwinding” series. Recommended for ages 13+, 4 stars. I’ve been wanting to read this for awhile, as I’ve heard it was good. Plus they recently released a movie version and I figured I should probably read the book before watching the movie. The speech of the students in the Battle School is hard to understand at times, as it is all slang. Honestly the first thing I thought while reading this is that it reminded me of a combination of the movie Starship Troopers (also a book by Robert Heinlein, though I’ve not read it yet), The Hunger Games by Suzanne Collins, and The Lord of the Flies by William Golding. Andrew “Ender” Wiggins is a third child, in a futuristic world where you are only allowed two. His parents have high expectations for him, namely that he get a place in Battle School for the Imperial Fleet. Earth has waged two wars against the Buggers, an alien insectoid race that attacked Earth about seventy years ago, and barely survived. All parents put their children into training for Battle School at two years old, but few make it through. Ender wins a place in the school at age 6 and must go away from everything he knows in order to pass all his classes and tests and ultimately become a battle commander. He is pretty much a genius in IQ but still has a lot to learn about relationships and his peers. Just as he is starting to settle into his own at Battle School, he is graduated early at age 10 and heads to Commander School. There he is taught by the legendary Mazer Rackam, who saved Earth from the Second Bugger Invasion. Will Ender be able to save the Earth from a Third Bugger Invasion and live up the expectations of everyone around him? The teachers of the Battle School have little private conversation at the end of each section of the book, about Ender. It starts with these two guys, Colonel Graff and his superior at the Imperial Fleet. They talk about Ender and his progress, but they make him sound like a test subject in an experiment, which I guess he is in a way, as they plan to make him the savior of the International Fleet. The whole time I was listening to this book, I thought that the story was one of the weirdest ones I’d ever heard, yet at the same time it was also such a crazy study of human nature that I couldn’t stop. This was a very hard book to summarize as there is so much going on at once. For a really good insight into the book, check out this link (http://www4.ncsu.edu/~tenshi/Killer_000.htm – warning there are spoilers). The book started off as a short story, and was later transformed into a book, after the author wanted to write a book about an older Ender Wiggin, but needed some back story about the character first. I am curious how they managed to pull this off as a movie, as I think it would be hard to abridge. Recommended for ages 12+, 3 stars. At the end of the last volume, the Library Task Force was set to guard a controversial exhibit from the Media Betterment Committee (MBC), who wanted to get rid of it. The MBC, in this volume, attacks the Task Force and Kasahara experiences her first real battle with guns, which leaves her a bit traumatized, thinking she has killed people (she just stunned them). Instructor Dojo helps her work through it. After the attack is over, the Task Force heads inside where they are ambushed first by the Anti-Violence League and then by a couple of MBC operatives, who try to destroy the artwork. Their commander steps in front of the work, physically protecting it with his body and they try to gun him down. In a work room, the director of the museum (who has been working with the Anti-Violence League) tries to burn the exhibition pamphlets but the leader of the local military base stops her, but is injured doing so. Once Kasahara finally comes back home, she realizes the depth of her feelings for Dojo and finally tells her roomie the truth (she is of course overjoyed having known forever). Dojo tells her that they are to meet up for tea (an actual date!!) in a few weeks time. My favorite part was the bonus manga (double check this) at the end where Dojo, Kasahara and the instructor who likes Marie (whose name escapes me at the moment) are trapped in this un air-conditioned basement helping with holds and they start hallucinating. Recommended for ages 13+, 5 stars. 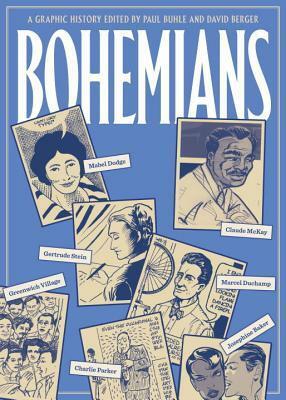 The book was about the history and culture of the people considered to be revolutionary in some way at the end of the 19th Century – early 20th Century. The book introduced me to a whole new group of people I’d like to learn more about, like Victoria Woodhull. Although I found the topic very interesting, it was hard to read. Not because of the subject matter (that was very well-researched) but because the text and graphics were so tiny. I thought maybe it was just the size of my Kindle, but I downloaded the book on my laptop as well to see if that improved the size, but it was the same exact size. I was not able to make it any bigger. I was straining my eyes to read each comic, which made me lose interest in it very quickly, and as a result only read about 30 percent. I hope the comics will be bigger in the paper format. I am not able to accurately rate it based on these conditions, but if the comics were enlarged and I could actually finish the book, I would probably give it 4 stars. As it is, I would give it 2 stars. I picked this one up because I love books on Japanese Food and am always looking for new interpretations of the cuisine. This book is fascinating because it not only has a slew of recipes, it also gives the history of type of recipes, which were specifically created to assist samurai. The author is descended from one of these families, and is a historian on the subject. I liked that the recipes represented both the ying and the yang, and were meals specifically created for different reasons, i.e. to give strength, fertility, a calm mind and stamina to a samurai and his followers. The cookbook makes me want to cook more with Daikon Radishes, as I’ve only recently discovered them and they seem to be such a vital part of the cuisine. I actually enjoyed the history more than the recipes. 3 stars. 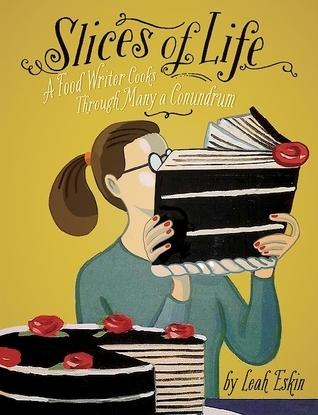 The author is a newspaper food columnist, for the Chicago Tribune, and I really enjoyed this book for the most part. It is memoir based off her “Home on the Range” columns for the above newspaper. I enjoy cookbooks where the author uses predominantly stories from her life and molds them around a recipe, which follows afterward. It has more meaning and significance that way, in my opinion. We follow the author as she is married, has a couple of kids and both her and husband start their career in the newspaper world. They move all over the US, and this influences what they cook, as well as what crises she is dealing with at the moment. The author also has to deal with some pretty major issues, such as breast cancer, the death of her beloved father and the family dog. Some of my favorite stories were the parenting stories like “Goodnight Room” the one about her son getting rid of his little kid books – which was reminiscent of Goodnight Moon, as well as “Good and Scared” about cancer, “Under the Influence” about good food and drink ideas, and “Table Surfing” about vacationing with her family in San Francisco. Some of my favorite recipes were for the Halva Crème Brulee, Dumpling Pillows, Casual Cherry Pie, Basic Brisket and Mango Bubble Tea. My biggest gripe about this book is the length. While I liked the stories, the book just seemed never-ending. I lost interest in the book for awhile because of this, which is the reason for the delay in writing this review. Maybe if the author shorted the amount of recipes or made it into a two-part book, it would work better. I also wish that there were some photographs of the food she made, or maybe even photographs of the author and her family. 3 1/2 stars. This past weekend I went to the Tucson Book Festival and had a bit of a fangirl moment when I got to see Young Adult author Chris Crutcher and got him to sign my copy of his latest book. I was first introduced to the author’s work when I was in Grad School for Library and Information Science and was taking a class on YA literature. We had to do a paper on a banned book and why it was banned. I picked Staying Fat for Sarah Byrnes (to be further abbreviated as SFFSB) because I had never read any of his stuff and I liked his book the best out of the ones we had to choose from. I read a couple of them, for example The Perks of Being a Wallflower, just to figure out which I wanted to write on. It’s weird but I had never heard of SFFSB, even though it came out when I was a teenager, but I rather enjoyed the book. The funny part was trying to explain the book to my mother, who immediately thought the book was horrible based on the number of times it cursed (there was a lot, I counted) or mentioned delicate topics like masturbation or abortion. I was also excited to see Chris Crutcher because I know how firmly he is on preventing censorship for teens, a topic that he has spoken on in length not only on his website (including SFFSB) but other public forums like magazines and the Book Festival. I sadly missed the lecture there because I mixed up the times. I also saw a very brief glimpse of Lois Lowry (who had signed a copy of The Giver for me about 5 yrs ago in South Carolina) and sat for part of a talk given by Laurie Halse Anderson, who wrote Chains. As usual I rate books on a scale of 1 – 5 stars, with one being the lowest and five the highest. 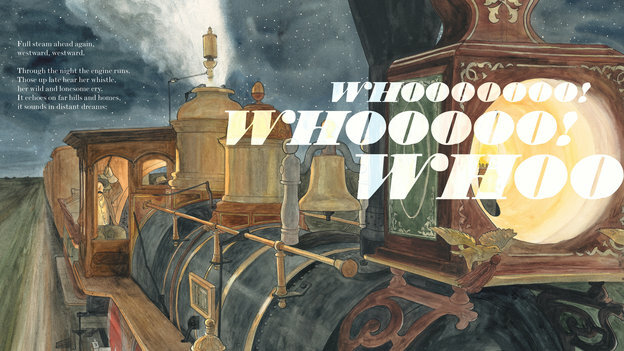 I am still trying to finish my Caldecott (need link) Challenge, and with all the winners and honors. I’m down to 18 books left to read. I’m also completing a Newbery Challenge, where I’m reading all (need link) the award winners and at least one honor book. I apologize in advance for the length of this post. It seems I have been a lot busier than I thought in the last month. So much so that I will have to split my normal book reviews post into two. The first one will be Children’s books and Caldecott, and the second one will be Newbery (Children and Young Adult), Young Adult, and Adult books. 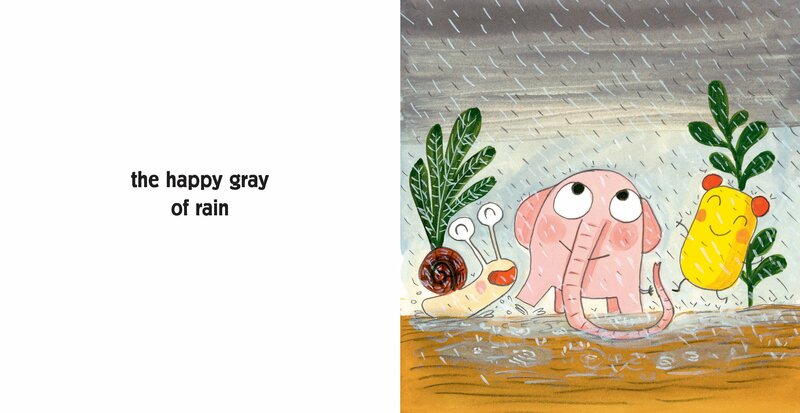 I like the idea of a tiny pink Elephant named Pomelo, the illustrations were super cute (they would be great for individual prints to decorate a child’s bedroom), and the ideas for color descriptions were very original. However, I think this book, like its predecessor (insert title) fell a little flat. Let me explain. 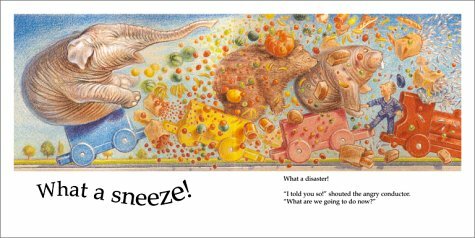 The book is all about Pomelo and his friends learning about different colors and how amazing it is to live in a multi-colored world. That part is fine. It seems like the intended audience for this book is toddlers/preschoolers who are just learning their colors, and despite the small pages, I don’t think this age group will pay attention for the entire length of the book. It is something like 70 pages. My 2 ½ year old lost interest somewhere around the second color. They definitely thought outside the box when picking the color descriptions, like “the mysterious blue of dreams”, “the comforting white of dandelions” and “the foamy white of hot milk”. The book would make a fun creative book for older kids, maybe do a lesson on colors or poetry. Recommended for ages 3+, 3 stars. I picked this up for my son because of his train obsession and it was funny because as soon as he saw the cover, he yells out “Clickety-Clack” and I was like “Wow, can he read that?” (he’s only 2 ½ ). Then I realized he probably has listened to it at daycare, and he said some of the repeating phrases along with me as I was reading the book. Needless to say, it was a huge hit with him. I enjoyed it too. I mean how can you not love a book with talking yaks, quacking ducks and mice who use fireworks! As I said earlier, the text repeats itself so a child can easily follow the pattern. Recommended for ages 3-6, 4 stars. 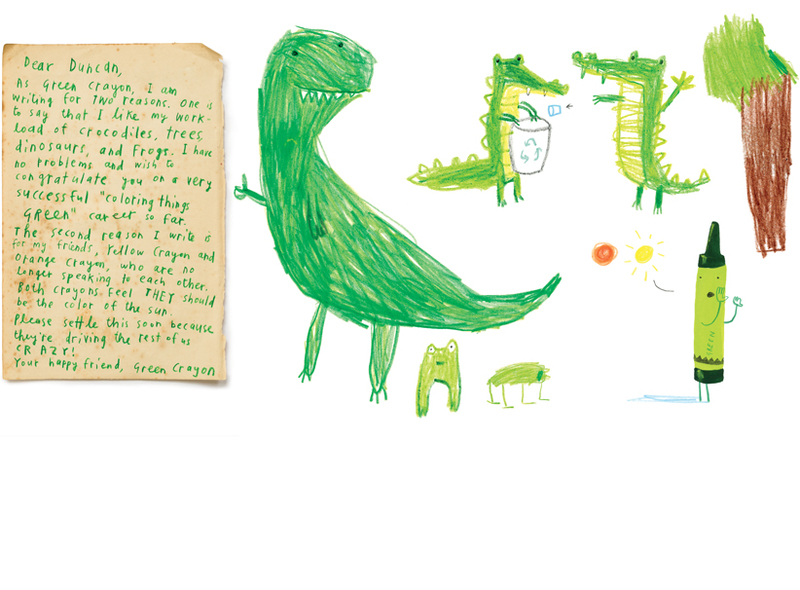 I love Steven Kellogg’s illustrations, they just remind me of my childhood. So when I saw this book for sale at a local used bookstore, I immediately bought it. I enjoyed the story more than my son did, mostly because I’m not sure he really understood what was going on, but he liked the illustrations. I have to admit I was cheering a bit when he went to the librarian for help. Every year, Uncle McAllister gets a really cool present for Louis’ birthday. This year he sent Louis a tadpole, which Louis just loves and even brings to show and tell at school. He names it Alphonse, discovers that he likes cheeseburgers, and Alphonse just keeps getting bigger and bigger. He outgrows the jar he came in, the kitchen sink and the bathtub. He is definitely not the frog that his teacher originally thought he was. So Louis smuggles Alphonse into the junior high swimming pool, and becomes a paperboy so he can keep feeding him his favorite food. When the swimming coach finds out about the creature, he tells Louis he has to be removed immediately. What is Louis going to do? He needs a permanent place to put Alphonse, but his parents can’t afford to buy a pool. So he enlists the help of Miss Seever, the school librarian. Will she be able to help Louis and Alphonse? To find out, read this charming story. Recommended for ages 3-7, 5 stars. 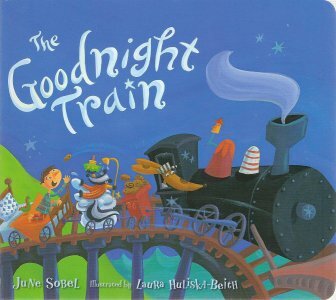 Another train book I picked out for my son, but he lost interest after a couple of pages. The concept was an interesting one, but some aspects of the story weren’t immediately recognizable, and thus made the book rather confusing. The book starts off with a rabbit named Mr. Barnes, who is going on a long train trip. He is completely surrounded by animals on the train, except for a little girl, who no one else seems to be able to see. I liked pointing out all the animals and getting my son to name them. But the story just keeps going and going, with no possible end in sight. At the end of the book, the reader finds out that the little girl is the actual subject of the book and Mr. Barnes is her stuffed rabbit that she brought along with her for the extended train trip to her grandparent’s house. I enjoyed the illustrations. Recommended for ages 4-7, 2 ½ stars. I will admit that when I saw the cover illustration for this book, I wondered if it was influenced by Harvey, that Jimmy Stewart movie about man with the imaginary 6 ft tall rabbit companion. I really enjoyed this story about a young rabbit who can’t stop growing, though I know my son was a bit disappointed that there weren’t any trains in it. Harold outgrows his family and must seek refuge in the deep forest, but he only finds predators though, so he must run away. He finds a field full of yummy vegetables, but the farmer doesn’t appreciate him eating his produce and tries to shoot him. Harold hides in an abandoned mansion during a storm and my favorite illustration from this scene is Harold completely overwhelming a tiny twin bed as he is sleeping in it. Two boys see him and tell some farmers, who chase him for months. Harold finally finds refuge in a barn, where a kind farmer lets him stay and then he ends up being a “thoroughbred” racer. Recommended for ages 4-7, 4 stars. I picked this one up not because I thought my son would like it, but because I loved the cover art (it is even better inside). The book was about the Insomniac family, a working mom, a stay-at-home father and their daughter Mika. The mom takes a job on the other side of the world, twelve hours away, and the family is unable to go to sleep at night. After the whole family is falling asleep in the morning, they decide to do something about it. They try to go find a bear, thinking that they hibernate through the winter so must know how to sleep at night, but are unsuccessful. So they decide that they will stay awake at night and go to bed in the morning, this plan is pretty successful. 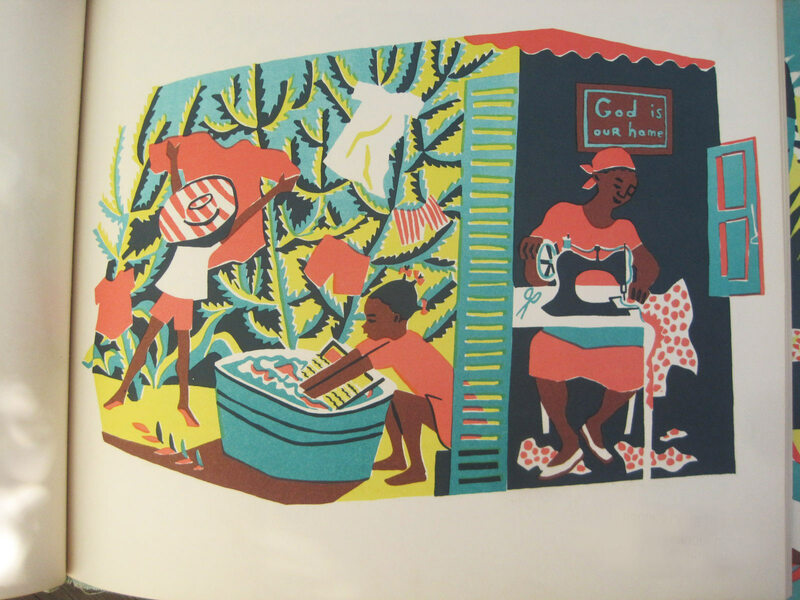 I loved the illustrations by the Brothers Hilts, they were so quirky and fun. Recommended for ages 4-7, 4 stars. I picked this up immediately when I saw it at the library, for my son. It starts out with a commuter train, which goes from the small towns to the big city, then switches to a passenger train that goes longer distances. From there, we see a freight train with an incredibly long line of attached freight cars containing things like steel, oil and wheat. Next is the Overnight Train with its sleeping berths and tiny bathrooms, and finally the High Speed Train. 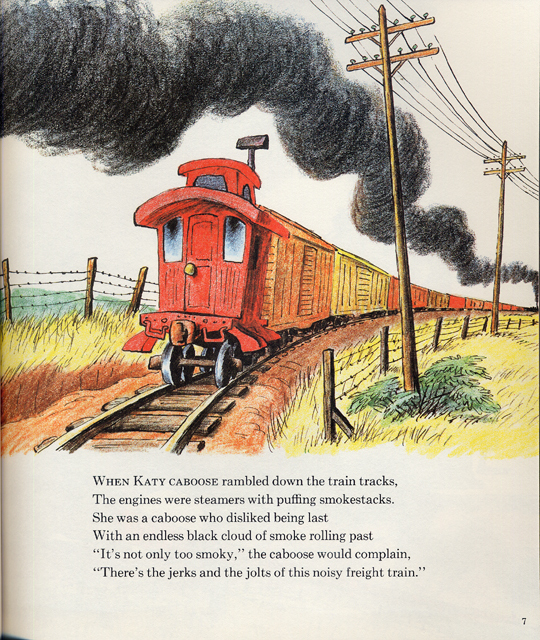 I loved the illustrations of all the different kinds of trains, and the little details like the animals that were passed by the train at the bottom of the pages. My only gripe was that the book was way too long for my son, as a read-aloud book. Recommended for ages 4-8, 3 ½ stars. I picked this one up for myself because the premise seemed amusing. I really enjoyed the look of the illustrations. 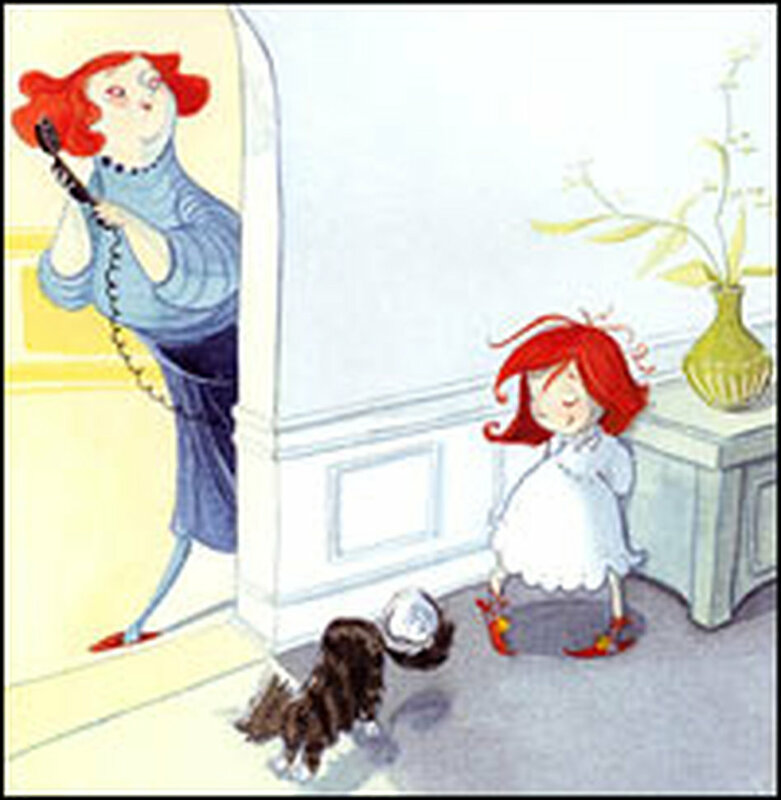 The premise to this rhyming story is that Mama gets a phone call from Uncle Fred and just wants to have a “quick little chat”, and so her daughter Rose must get ready for bed. But before Rose can really get started, there is someone ringing the doorbell saying they’ve got party supplies to deliver, so she lets them in. Then all these guests, waiters, and musicians start arriving and pretty soon she has a full house, and her mother is still on the phone. Part of me wondered how on earth the mother couldn’t hear all these people coming in to her house and a party going on, and the other half was just in awe of the story wondering how it would end. Will Rose be able to get rid of everyone and make it to bed before her mother finishes her chat? To find out, read this captivating book. Recommended for ages 4-8, 3 ½ stars. I had seen this book at the library book sale, but had not picked it up because I had never read the book, but decided to try to read it at the library when I got the chance. I’m glad I did. It was a cute story. Chester decides as a piglet that if he wants to avoid the common ending of a pig (being made into food), then he needs to do something extraordinary. He eventually manages, after much trial and tribulation to balance on his nose on the top of a fence post. He waits for the circus train to pass the farm so he can be noticed, but ends up taking it upon himself to do it as the circus folk were all asleep when the train passes. He is quickly discovered and put in the show, though after being put in an act with some tigers and being so terrified he couldn’t perform, he is re-delegated to the clown’s baby buggy and later chained up so he can’t escape. He does eventually manage to escape off the train, only to run into a wild bear and then a group of Hobos, who both try to eat him. He decides that he’s had enough and goes to a farm, where he does live the life of a pig and grow fat. On the day he is to be slaughtered for food, he is saved by a traveling showman for double his worth. Can you guess why? To find out, read this enchanting story. Recommended for ages 4-8, 3 stars. I’ve been wanting to read this book for ages, but it is always checked out. This book is Neil Gaiman at his zaniest, which I just love! The illustrations were hilarious and really made the story even funnier. The book is all about a family with two kids. The mom has gone away to a conference and the father is left in charge. When the kids get up in the morning to eat cereal for breakfast, they realize that they are completely out of milk. So the dad goes to the store to get some more and he is gone “for ages and ages.” When he finally returns he has quite the tale to tell. He claims he was on the way back from the shop when he is abducted by aliens, goes back in time and end up on a pirate ship, gets rescued by a dinosaur professor, does some more time travel and meets some vampires. All in one morning, of course! The children do not believe his story, as they think he just took elements from around their kitchen, like the sister’s book on vampires and the son’s dinosaur toys. But they’re not quite sure as he does have the infamous milk. Highly recommended for ages 6-10, 5 stars. I picked up this book browsing the children’s section. This is one of those books that I think I would like if I had grown up in a French-speaking country or knew the films of Jaques Tati, who was apparently famous for originally creating the tragic comic character. David Merveille took Mr. Hulot and converted him to a wordless picture book, which is pretty ingenious if you think about it. I loved the 1930s-looking illustrations and the crazy situations Mr. Hulot seems to constantly find himself in. Recommended for ages 6-10, 3 stars. An inventive ABC rhyming book written for city kids, this book is a little dated. It won a 1949 Caldecott Honor. 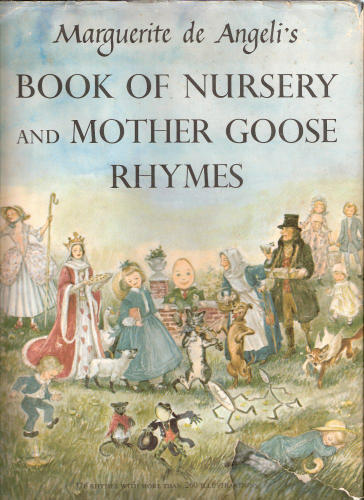 Some of the subject words were a little weak, but I thought overall the rhymes were excellent with good vocabulary. I will say that I always get a little bummed when people can’t come up with good word for the letter X and like to use “X-tra Large” or “Xtra Cheese” instead. Recommended for ages 4-7, 4 stars. 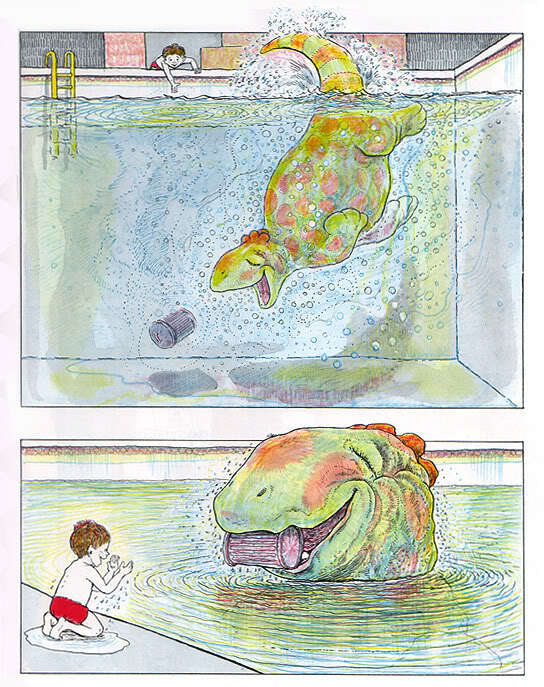 Every time David Wiesner creates another wordless picture book, I swear he gets more and more imaginative. Though this one had been on my to-read list for awhile, it made an appearance sooner rather than later after winning a 2014 Caldecott Honor. Mr. Wuffles is a black and white cat (reminds me of my cat growing up). His owner keep buying him toys to play with, but he is never interested in any of them, until he finds a small spaceship-sized one. Only it’s actually a tiny spaceship complete with aliens, intent on colonizing our planet. They manage to escape from Mr. Wuffles under a countertop, and it is here that they meet ants and a ladybug. They befriend one another, and help each other to escape Mr. Wuffles’ clutches, and allow the aliens to return to their ship. Recommended for ages 4-7, 4 stars. 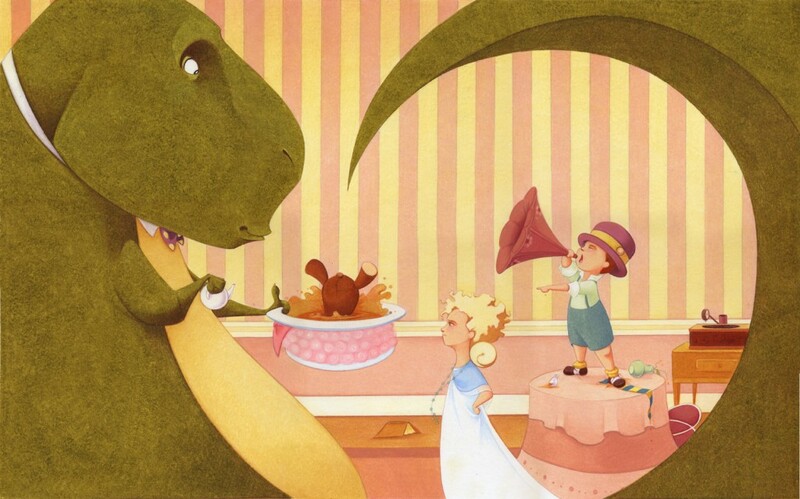 I realized after I read this book, that the author/illustrator also created Tea Rex, another recent book I’ve read that I thought was really creative and different. This books follows in the same vein, though this one is wordless. It reminds me a lot of Fantasia 2000 as the flamingos in that movie were practicing ballet as well. This book won a 2014 Caldecott Honor and rightly so. 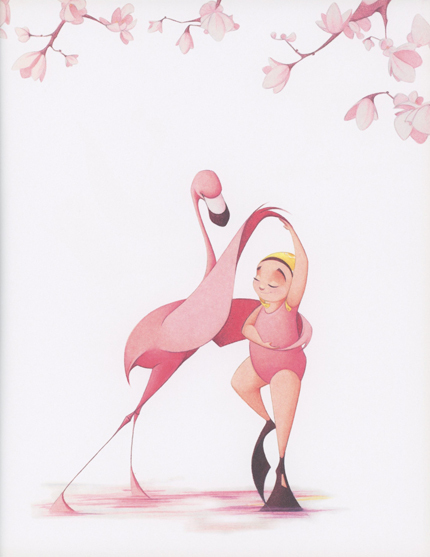 I just love not only the ballet positions but also the facial expressions on the little girl as she mirrors the flamingo. Recommended for ages 3-6, 4 stars. I had been putting off this one for awhile due to its length (a bit too long to read to my son). I really enjoyed the last book, Roger and the Fox, that I read by this author and illustrator team. This book won a 1950 Caldecott Honor, and it’s the best one I’ve read so far from that year. Johnny is a young boy who has bought a backpack for himself, filled it with a lunch, and intends on going hiking in the woods. On the way there, he sees some of the people he regularly helps out with chores, but is too intent on his mission to stop. He also runs into the Professor, who is always rescuing animals from the nearby woods, and who reminds Johnny about his birthday party that afternoon. Johnny totally forgot about it, so he starts rushing around trying to find a suitable gift. He makes the Professor a card out of a piece of birch wood. While on the edge of a pond, he spots some ducks flying overhead and then sees one in the pond. He decides that he wants to catch it for himself. He of course gets completely covered in mud in the process, and his mother refuses to allow him to keep the duck, even though it is injured. He brings it with him to the Professor’s house, and he shows the boy three ducklings that he’s found. Johnny adds his duck to the Professor’s pond, which turns out to be female, and she starts leading the ducklings. He asks the professor to keep the duck and fix its wing, and the professor decides to name the duck Birthday Cake. Recommended for ages 5-8, 3 stars. 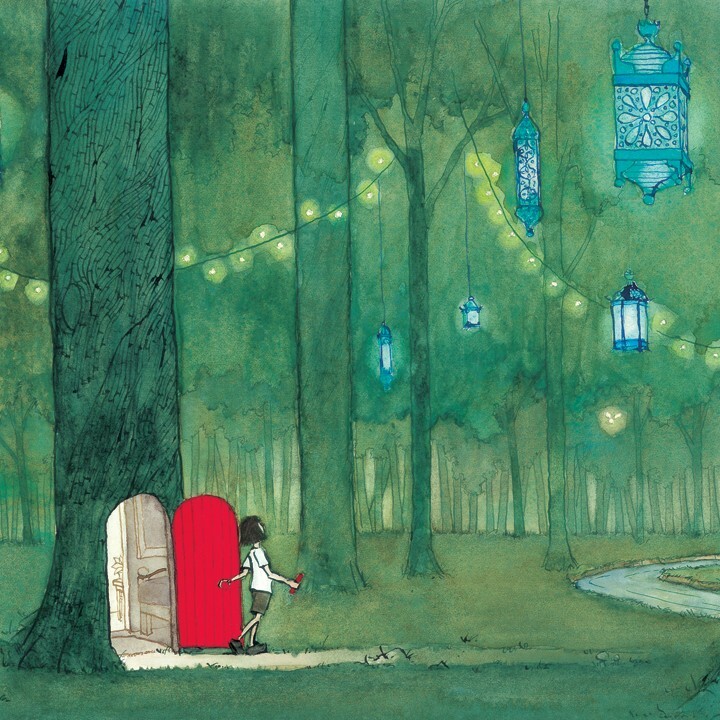 This seems to be the year for wordless picture books, as all 2014’s Caldecott Honors books are wordless. This one has almost no color in the beginning, all white and grey illustrations, except for one item of importance that is colored in bright red. The basic storyline is a girl who is ignored by her parents and sister, so she finds a red crayon and draws a door on her bedroom wall. This opens and she finds herself in a forest somewhere else. It is here that the illustrations get more way more colorful. Her adventures continue until she meets a boy with a similar magical purple crayon. 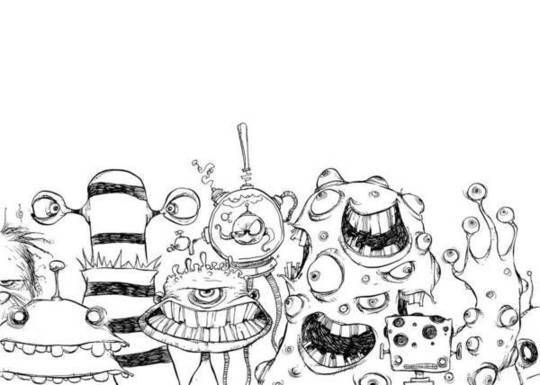 The illustrations, despite their lack of color, are full of imagination, whimsy, and lots of little details. I couldn’t wait to see what the girl would do next with her magical crayon. Recommended for ages 4+, 4 stars. 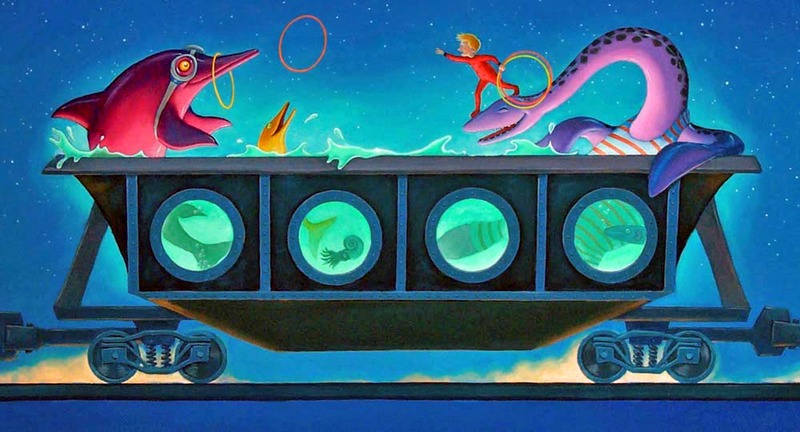 The author and illustrator Leo Politi can do everything. 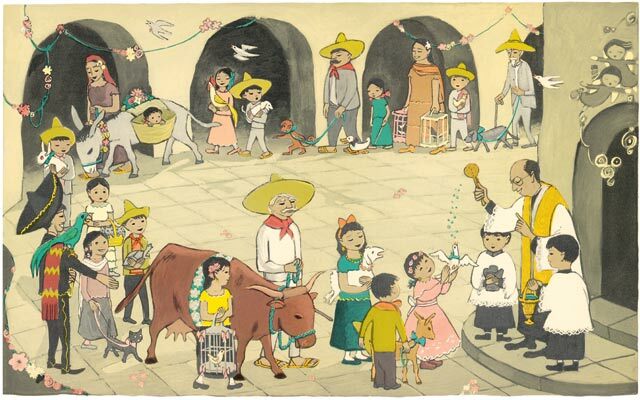 He creates delightful multicultural stories with adorable illustrations, and writes music and lyrics for his books (though some are traditional songs I believe). This is the third book I’ve read of his for the Caldecott Challenge, and this won a 1949 Caldecott Honor. The book is another book that starts on Olvera Street (the same as his book Pedro, the Angel of Olvera Street), which is the Hispanic part of Los Angeles. On the street are shops owned by Mexican families, including one named Juanita after the shop owner’s young daughter. Juanita is turning four years old and her parents have bought her a dove for her birthday, and her mother has sewn a beautiful pink and lace dress. Juanita takes the dove everywhere with her. On the day before Easter, the local Catholic Church has a Blessing of the Animals ceremony and all the local families and their pets attend, including Juanita in her new dress with her dove. After the day’s excitement, Juanita’s dress is hung back up for Easter Sunday and her mama sings her to sleep (the music/lyrics are included in the book). Recommended for ages 4-7, 4 stars. There was a bit of a wait on this book and I can understand why. This was a truly fascinating book and I know this, and the fabulously detailed illustrations, is why this book was the 2014 Caldecott Award Winner. The first thing I thought of while reading it was that it was like a G-rated version of the show “Hell on Wheels”, as it too is about building and traveling on the newly-created Transcontinental Railroad. We follow a family traveling from one end, which starts in Omaha, Nebraska and ends in Sacramento, California in 1869. If you think about it, considering that sixty years earlier, people were using covered wagons to travel across the country, a steam-powered train was a pretty revolutionary way to travel. Although the book was way too long for my son to sit down and listen completely through, he loved the up-close-and-personal brightly-colored watercolor, ink, and gouache painted illustrations of the train. The end pages in the back of the book featured a diagram of a steam train and showed where all the components talked about in the book were, like the Johnson Bar (kind of like a car shifting control) and how the fire builds up the heat for the water, that is carried from the tender to the engine, to boil and create the steam used to power the train. The end pages in the front of the book show the route of the Transcontinental Railroad, which is helpful as they don’t always mention the state or territory in the book, usually just the city or town name that the train stops in. It also features the piece of legislation that created the idea for the Transcontinental Railroad, signed by President Lincoln. 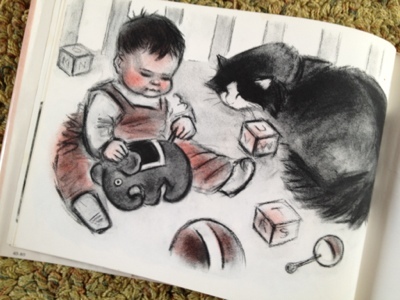 It is long for a picture book at 64 pages, but well-worth the effort of reading it aloud. Highly recommended for ages 5-10, 5 stars. One thing I love about the Caldecott Challenge is that I get to read and find all sorts of lovely new books, authors and illustrators. I have fallen in love with Marcia Brown’s work. This book was a 1950 Caldecott Honor. It is about a young boy named Henry who lives in the Virgin Islands. All of the male members of his family have been fishermen, and he can’t wait to be one himself. The story tells about Henry and his family, and what he does on a normal day. 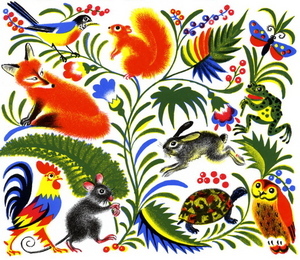 I love the bright and colorful illustrations! One day, Henry’s father lets him go fishing with him, and sends him down to unhook the fish traps, where Henry narrowly escapes from a shark. Recommended for ages 3-7, 4 stars. I wasn’t a huge fan of their other book, Finders Keepers, but since this is also a Caldecott book, 1951 Caldecott Honors this time, I figured I would give it a try. It was a charming story. The Two Reds of the title are a young boy named Red (not his real name but he has red hair) and a homeless cat (whose real name equivalent is hilarious) also named Red that live in the same neighborhood. The boy and cat don’t like each other because they both like fish, but for different reasons. It is early in the morning and the cat is hungry, so he goes in search of food. The boy goes out to play, and wants to ride a fruitman’s horse, but he is a work horse not a riding horse. Both Red the boy and Red the cat try to catch a pigeon. Red watches a group of boys called the Seventh Street Signal Senders performing a secret initiation, after he smells a fire, but they catch him watching and start chasing after him. Red the cat steals one of the fishman’s fresh fish and runs away, where he collides with Red the boy and each get away from their pursuers. They decide the other is not as bad as originally thought, and spend the rest of their time together. Recommended for ages 4-7, 3 stars.